Built for work and play with a 180° hinge, the 14" 32GB Multi-Touch Chromebook 14-ca070nr from HP provides a seamless Chrome experience and access to Android apps via Google Play. Enjoy the power you need and entertainment features to do even more. This HP Chromebook has a 14" SVA WLED-backlit display with a 16:9 aspect ratio and an HD 1366 x 768 screen resolution, all of which are powered by the integrated Intel HD 500 Graphics chipset. The display is also an edge-to-edge touchscreen, allowing users to take advantage of the supported multi-touch gestures that are built within Chrome OS. The system is powered by a 1.1 GHz Intel Celeron N3350 Dual-Core processor that can be boosted up to 2.4 GHz. It also has 4GB of 2400 MHz LPDDR4 RAM, 32GB of eMMC storage, 802.11ac Wi-Fi (2x2), an integrated 720p TrueVision HD camera with dual-array digital microphones, plus built-in stereo speakers that are powered using B&O PLAY audio, and a multi-format card reader that supports SD media. External peripherals, such as extra storage, optical drives, mice, and more may be connected using the two 5 Gb/s USB 3.1 Gen 1 Type-C ports or two 5 Gb/s USB 3.1 Gen 1 Type-A ports. Additional compatible peripherals may be paired using Bluetooth 4.2 technology. Google Chrome OS is a Linux-based operating system designed by Google to work exclusively with web applications. 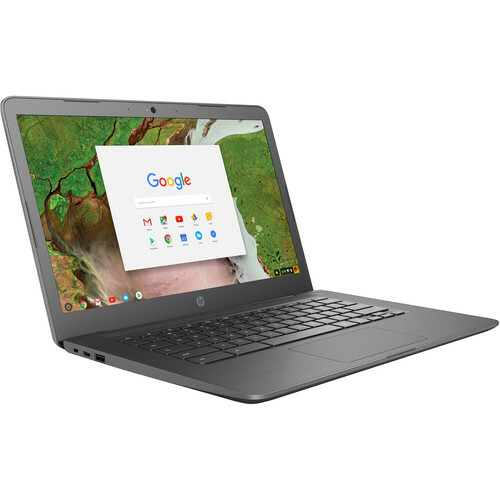 The HP Chromebook 14-ca070nr combines the aspects of a pure cloud client with the hardware of a traditional portable computer, which puts it in its very own class of netbook and notebook computers. Included with this Chromebook is a 45W AC adapter and its rechargeable 2-cell / 47.36Wh lithium-ion battery lasts for up to 11.5 hours before recharging is required. This system is well-suited for your daily dose of entertainment. It includes dual speakers, audio by B&O PLAY, plus a 180° hinge that makes it easy to collaborate and share with others. HP's Chromebook Chromebook 14-ca070nr delivers plenty of power to take on your day. Also, get fast connectivity and up to 11.5 hours of battery life. With an 802.11ac (2x2) WLAN adapter and Bluetooth 4.2, network connectivity is fast and reliable. This processor provides performance, power consumption, and value to help your device run smoothly. Integrated graphics renders the visuals a with smooth and vivid quality. Access millions of Android apps for entertainment and productivity. Get 100GB of cloud storage for two years with Google Drive. Save, access, and share your photos, videos, and files almost anywhere. Video chat with clarity, even in low light. Box Dimensions (LxWxH) 17.7 x 12.0 x 2.7"